In this article, I want to explain a pattern that I like to use whenever I model something, it’s fairly straightforward. It involves using identity columns primary keys for all object tables and compound keys for all relationship tables. Surprisingly, even with these restrictions, there’s still a lot of flexibility possible in the data model. In fact, I conducted an exercise at work where colleagues designed a database model based on this rule of thumb. (The exercise was like pair programming but for db design, ask me about it some time). 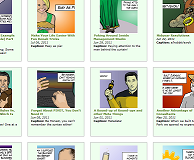 Attendees were given the instructions: “Identity columns for objects, compound keys for relationships” and I found that there was still a large variety of designs. For example, ask yourself how you would model a SHIFT table (as in scheduled work)? Is it an object, or is it a relationship? It sounds like it’s own object, but it can also be thought of as a relationship between employee and time slot. 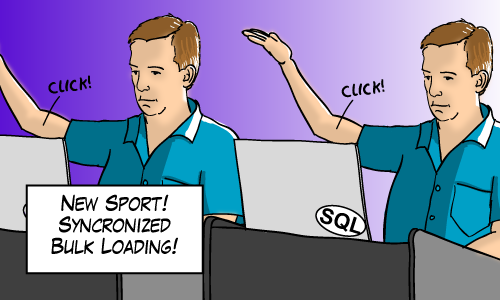 Imagine you want to track the new sport Synchronized Bulk Loading (the sport will make its premier at the 2012 SQLympics in London). Every time I see a two dimensional chart like this, I look to see whether it’s appropriate to use this pattern. I see this pattern a lot. 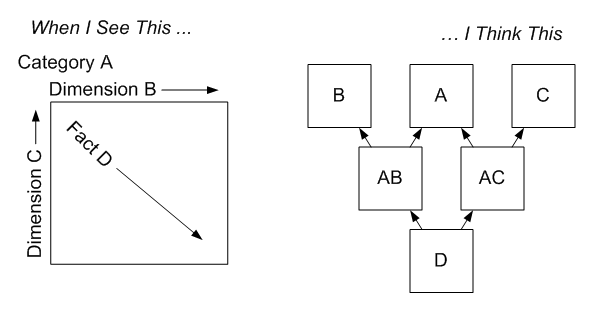 Simple diagram for this example's schema. I want to compare two different schemas, The first one is my preferred one. It uses identity columns only for object tables (not relationship tables). The second one uses identity columns for everything. 1. Business Constraints seem easier to enforce. We get some of this data integrity almost for free! For example, we get to enforce the business rule that scores apply to judges and athletes who are participating in the same event. It is impossible for some rogue application to insert a score that applies to a judge and an athlete who never participated in the same event. /* For schema B, this is difficult and hairy. I could write a sample solution but it's not instructive. By using natural keys, In Schema A we have the option of using a column such as EventId as a partitioning column on all tables. You can’t say the same for Schema B.
It’s true. It does seem like I’m setting up a straw man just to knock it down again. But I see designs like Schema B often so the example is not far fetched. And if something like Schema B makes it into production systems, it gives the that schema an enormous amount of inertia because at that point “refactoring” the schema will cost a lot (in time, money, you name it). Wouldn’t you want to also include a primary key on A.SCORES? 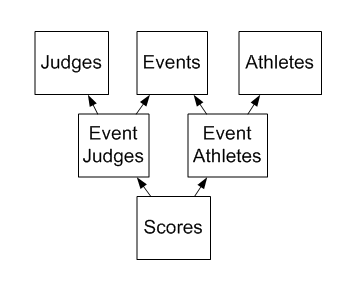 PRIMARY KEY (EventId, AthleteId, JudgeId) to enforce that a given athlete can only given a single score by a judge for a particular event? I know this isn’t directly related to the design you’re trying to highlight, but I was just wondering if this is a simple oversight, or if there’s a reason it was left out. Good catch aaron, I can’t believe I missed that. I’ll update the article soon because mistakes like that are distracting aren’t they. So a post about data modelling with no data models…only DDL. My heart is broken. So by data models, you mean entity relationship diagrams showing logical models and physical models right? (with relationships labelled, etc…). Re: the spelling of modelling. I seem to remember learning how to spell that properly during a talk about contentious issues. I learn from the best. I was thinking a while on your point “1. Business Constraints seem easier to enforce.”, if i can break it.. I agree this is awesome. I just wonder why did you take Name Unique in Schema A. Is there a specific reason? I made Name unique in Schema A because it is a candidate primary key. I did not make Name unique in Schema B because I simply forgot. So people should not assume that I claim anything by that difference. Thanks for catching that.